We Work Harder to Make Choosing Software Easier! Accurately select the best software using an unbiased requirements list, RFP template, & Demo script with in-depth software selection templates & tools. 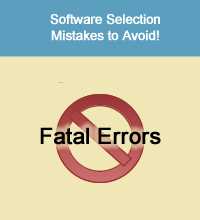 Optimize the software selection process! Completely identify ALL your software requirements using these checklists loaded with application-specific criteria. 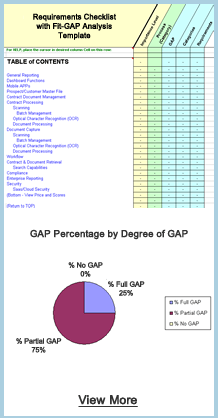 Fit-GAP Analysis enables more accurate identification of all software requirements. Quickly distribute an effective RFP customized to your needs. Query vendors as needed to obtain actionable vendor proposals. Each includes matching response comparison, evaluation, and software selection tools. Vendor Software Demo Scripts enable viewing how a vendor's proposed software performs in critical operating scenarios. This improves the accuracy of all decisions needed when choosing the best software. Each RFP & Selection Toolkit helps you hit the bull's-eye in all major areas: requirements identification, system evaluation, and software selection. Each Toolkit contains a collection of customizable templates that save time & money during each step of the system evaluation and selection process, all of which helps you select the best software solution. Ensure the best choice is made - see the RFP Capability Checklist. If you need to identify user needs and requirements this toolkit will save you significant amounts of time in any software selection project. Use the integrated Fit/GAP Analysis Matrix to determine user needs more precisely, and ensure that all business needs, workflow, and software requirements are accurately identified. Make the software selection process easier from the start! This detailed software requirements list is useful in many ways. First, send it to users of your current system enabling them to quickly and accurately identify what is and is not important for their needs. This helps focus software selection efforts more precisely. These requirements checklists quickly become a software selection guide that helps prevent crucial needs from "slipping through the cracks". REQUIREMENTS CHECKLISTS ACCURATEL IDENTIFY ALL SYSTEM NEEDS - Starting to plan a new system? These tools can guide the way to success! Use these detailed software requirements as a planning tool, or as a user needs survey, or as a selection template. Also included in each requirement checklist is an easy-to-use Fit-GAP Analysis Matrix to better document, categorize, and evaluate ALL requirements and potential sources of savings before new software is selected. REQUIREMENTS CHECKLISTS ACCURATEL IDENTIFY ALL SYSTEM NEEDS - Starting to plan a new system? These tools can guide the way to success! Use these detailed software requirements as a planning tool, or as a user needs survey, or as a selection template. Also included in each requirement checklist is an easy-to-use GAP-Fit Analysis Matrix to better document, categorize, and evaluate ALL requirements and potential sources of savings before new software is selected. Uncover Hidden Requirememnts - Use a comprehensive requirements list to quickly and thoroughly conduct in-depth software requirements identification and gathering activities to ensure all business, workflow, and user needs are addressed. Use the button below to see how detailed they are. Helps pick the best software! Accurately choose the best software! Prevent expensive do-overs and other time-wasters by using these in-depth RFP templates, requirements checklists, and selection matrices desigined specifically to evaluate and select software based on your exact needs. The advanced capabilities of each RFP template are the most comprehensive in the RFP industry, and are guaranteed to address all standard application requirements. Designed specifically for selecting software, these detailed RFP templates enable the creation of an RFP tailored to your needs. Available for over 100 applications, each customizable RFP Template is pre-loaded with thousands of software selection requirements guaranteed to address all industry standard criteria and BEST PRACTICES. Organized by business process, these RFP templates can be used as user requirements checklists in addition to eliciting proposals from vendors in any software acquisition project. Follow this link to obtain example RFP Questions tailored to your organization's needs. Avoid Fatal Omissions - These specialized Request for Proposal templates contains a highly detailed collection of system requirements and Cloud/Web-based SaaS operational & security evaluation questions to investigate all aspects of a proposed solution. Prevent False Starts when evaluating, selecting, and implementing Cloud-based or On-Premise systems. A comprehensive set of ratios, scorecard, and comparison functions for software RFP response evaluation provides tools for thorough investigation of all vendor system proposals. Make the best software choice! System Evaluation and Selection Toolkit - Comparing and evaluating vendor responses (proposals) to an RFP can be very time consuming. Now you can make the vendor proposal evaluation and selection process faster, more accurate, and more consistent! These tools and templates provide weighted grade scoring, functionality heat maps, detailed side-by-side comparisons, and response quality analysis ratios. 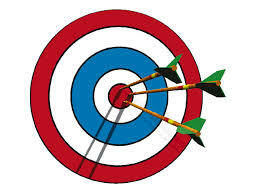 Vendor RFP responses are scored at all levels - functionality, operational, and financial. This ensures the best software is chosen, i.e., an optimized software selection that fits both your requirements and budget. 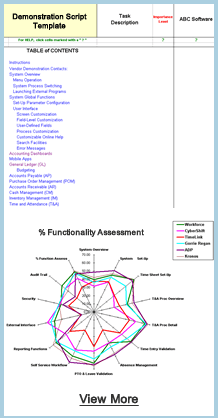 Review all software evaluation and selection tools. DEMONSTRATION SCRIPTS - Optimize this step of the software selection process by ensuring all vendor demonstrations consistently address your organization's needs as identified in your Request for Proposal (RFP). Each Demo Script Template enables all software selection team members to score each individual demonstration based on his or her priorities. 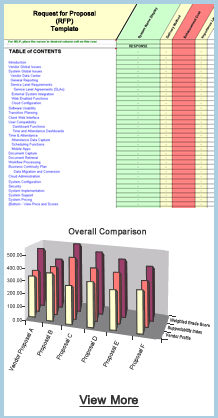 Easily compare the demonstration scores of competing software, whether they be on-premise or web based. Learn how a Demo Script can help your software selection efforts at "Why a demonstration script is needed". Ensure each demonstration stays on schedule and covers everything the IT and End-User team needs to see in the time allotted. These templates are ideal for managing on-site demos lasting several days involving multiple user groups. Investigate proposed software weaknesses uncovered in each vendor RFP response (proposal) to your Request for Proposal documents. Ensures all vendor presentations are performed consistently, with all functionality demonstrated in the same order in the same amount of time. Detailed Analysis and Evaluation functions identify each demonstrated product's strengths and weaknesses. Ensure the best selection decision is made. This template is very useful if you already have a short list of software products and now need a way of consistently gathering and evaluating meaningful information about each. It is also extremely useful at a trade show, since it enables you to quickly and consistently collect detailed software information from many vendors in real time at a trade show. Interactive Software Evaluator - Ideal for making your final software selection decision by collecting and analyzing software features information using a customizable Software Features Matrix that evaluates entries in REAL-TIME. Makes the best software choice! Free requirements lists, RFI/RFP sample templates, and examples provided by vendors are notoriously biased. Don't waste many hours of time trying to search them out on the Web, then manually trying to paste them together just to produce an incomplete requirements checklist. And don't waste even more time manually preparing and evaluating an old-fashioned paper-based RFP Request for Proposal, or installing then learning new system selection software! Each detailed Infotivity Request for Proposal template and matching requirements checklist is a fully integrated, ready-to-use RFP, complete with a matching decision matrix toolkit for vendor response evaluation that streamlines the tasks involved in identifying your business needs, mapping each business process, then selecting and implementing the software system best suited to your firm's prioritized needs. Ensure a more productive process for requirements gathering, evaluating, and selecting software is put into place. Why settle for using just RFP examples? Used around the world since 1989, all Infotivity RFP Template Masters contain comprehensive criteria for selecting software, are fully CUSTOMIZABLE, and are guaranteed (certified) to address all industry standard criteria. In addition, all RFPs query vendors with questions about real world software requirements using quantitative software selection techniques as outlined by the Carnegie Mellon Software Engineering Institute (SEI) and CMMI Institute. Avoid rip off! Click here to view real-world RFP Templates with detailed RFP questions for your desired application. Follow this link for ERP software selection. Each Request for Proposal (RFP) template, i.e., model, comes complete with a comprehensive software proposal evaluation matrix and selection guide to help ensure your process mapping, system planning, system comparison, response evaluation, and system acquisition decisions are based on ALL the critical requirements needed for successful system selection and implementation, whether it be a traditional on-premise software or Web/Cloud-based Software as a Service (SaaS). Use the above software requirements checklist, RFP templates, evaluation matrices, guides, and other in-depth tools for selecting software to make the BEST decisions possible. All products are covered by our 30 Day, 100% Money Back Guarantee, and telephone support is always FREE! Return to the TOP of the Software Selection Tools Page. "The detailed requirements we found in the RFP template for process manufacturing ERP, as well as Infotivity's effective help, enabled the successful outcome of our ERP software selection project." 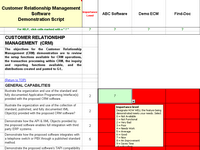 Each RFP template toolkit includes ALL the tools needed to choose software more accurately, as described above. This includes the tools needed for software selection criteria, quickly identify user needs, accurately determine system requirements, distribute an RFP, compare & evaluate vendor software proposals, and select the best software for your organization's needs. The best software selection process !